Three different endings, and unlockable bonus content once you play through each ending. Estimated reading time per path: Around 15 minutes. 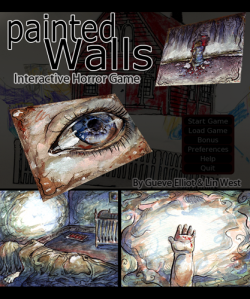 Red Walls is a stylistic visual novel made in Ren'py with a dark atmosphere. The story is narrated by the voice of a little girl who is mentally disturbed. She has a very close attachment to the walls, and the choices she makes threaten what little stability there is around in her in different ways. Author's Notes: This experimental project has been on the backburner for over a year. Initially we were planing to do the game in flash but we really didn't have too much coding no how and so we ended up never finishing it. Lucky some time later I was doing some digging on visual novels and found Ren'py. So, here we are with our first finished project.